This example shows how to create a block library and add it to the Simulink® Library Browser. This example also shows how to add a sublibrary. You create a function slblocks to specify information about your library. You can save the function as a .m or .mlx file. You cannot save it as a P-code file. From the Simulink start page, select Blank Library and click Create Library. Add a Gain block and a Subsystem block to the library. Remove the inport and outport from the subsystem. Name the Subsystem block My Sublibrary. To link it to a sublibrary, in the My Sublibrary properties, set the OpenFcn callback to mylib2. At the MATLAB® command prompt, enter this command to enable the model property EnableLBRepository. Your library can appear in the browser only if this property is on when you save your library. Save the library in a folder on the MATLAB path. For this example, name the library mylib. Create another library mylib2 and add some blocks to it. At the MATLAB command prompt, enable the model property EnableLBRepository for the new library. Save mylib2 to the same folder you saved mylib to. You can close both libraries if you want. In MATLAB, right-click the folder you saved the library to and select New File > Script. Name the file slblocks.m. Open slblocks.m. Add this function to it and save. In the Library Browser, refresh to see the new library and sublibrary. Right-click the library list and select Refresh Library Browser. The figure shows the example library mylib with the Library Browser name My Library. Because of the callback you created, clicking My Sublibrary displays the contents of the mylib2 library. If you saved your library without setting 'EnableLBRepository' to 'on', a message appears at the top of the Library Browser. Click Fix and respond to the prompt as appropriate. You can specify the order of your library relative to the other libraries in the list by adding a sl_customization.m file to the MATLAB path and setting the sort priority of your library. For example, to see your library at the top of the list, you can set the sort priority to -2. By default, the sort priority of the Simulink library is -1. The other libraries have a sort priority of 0 by default, and these libraries appear below the Simulink library. Libraries with the same sort priority appear in alphabetical order. This sample content of the sl_customization.m file places the new library at the top of the list of libraries. 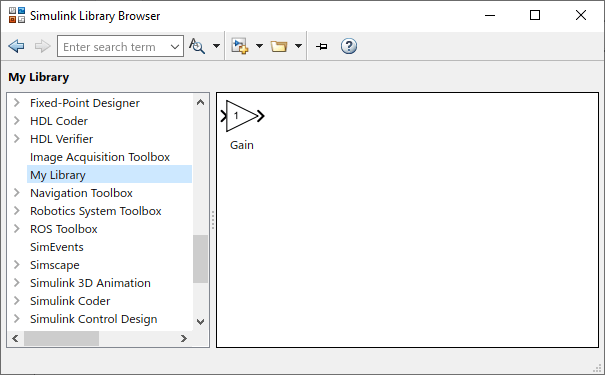 % Change the order of libraries in the Simulink Library Browser.